A successful online community can pay off in increased word of mouth (35%), more brand awareness (28%), bringing new ideas into the organization faster (24%) and greater customer loyalty (24%), according to the 2008 Tribalization of Business study by Beeline Labs, Deloitte, and the Society for New Communications Research, which surveyed more than 100 business with online communities. That the greatest value of an online community lies in “communications-based objectives” — in forging bonds between the organization and its members/users — shouldn’t come as a surprise. Arguably, it’s the members’ level of engagement with an online community that determines whether that community will flourish or fail, not the technology “bells and whistles” of the community’s website. After all, a vital online community can be created across multiple platforms — cross-pollinating your organization’s blog with an online discussion forum, reaching out into Facebook and other social media, and so on. In fact, the 2008 Tribalization of Business study found that the greatest obstacles to making a online community work are not issues related to technology. 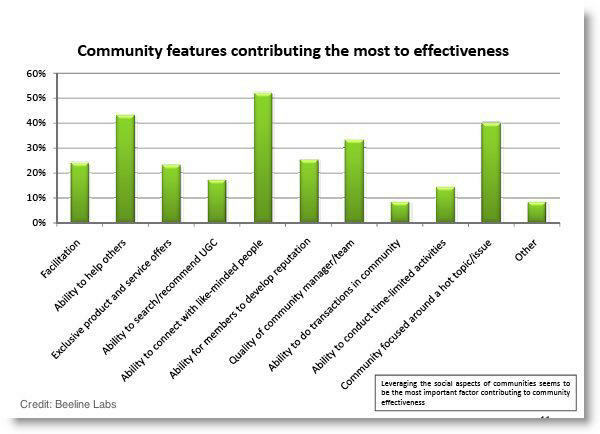 Rather, it reports, the success of an online community depends on attracting people to the community (34%) and getting them involved in it (51%), and finding enough time to manage the community (45%). The benefits that can come from building an online community for your organization are clearly defined, and the features that contribute most to making it work — but how do you go about measuring whether a community is successful? 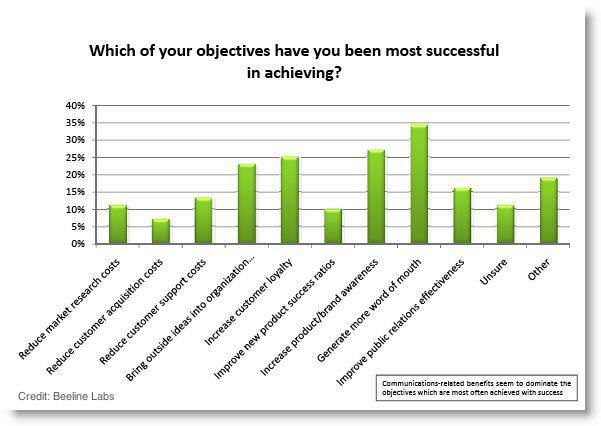 “One interesting discovery was the apparent inconsistency between what organizations set as goals and what they actually measure,” said Francois Gossieaux, a partner at Beeline Labs, and Senior Fellow with the Society for New Communications Research. Survey participants said that their main objectives were to generate word-of-mouth marketing and to build customer loyalty, but what they’re mostly measuring is the number of visits to the community website. The 90-9-1 rule suggests that an online community looks a lot like an iceberg: only the 1% tip of your membership will be involved in actively creating content, while 90% of visitors are satisfied simply to “lurk” and read. Assuming that's the case, would it be more informative to measure the activity of the 1% creators — to track the comments on your blog, for example, or the number of new threads in your forum — and discount the passive audience? Or should you focus on the standard traffic analytics, like numbers of visitors and page views, more reflective of the 90% who aren’t engaged with your community in an active role? 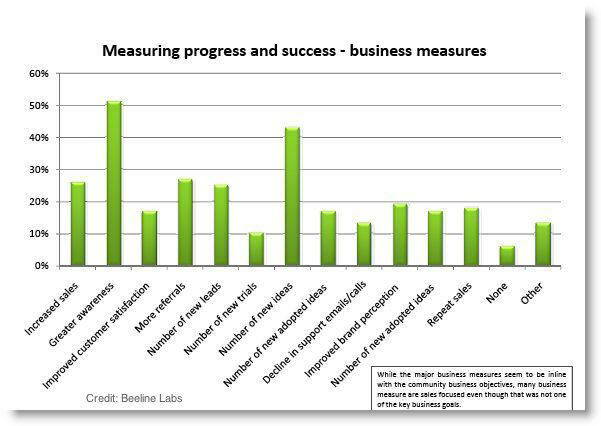 How do you define (and measure) “success” for your online community? We have a very active online community, most of whom are non-posting members. It would be a mistake to discount the non-posting audience or their needs. I've found many of them to be the ones who find great value in our community even though they actively do not participate. Some of our non-posting members are among our larger donors and our greatest "evangelists" spreading the word about our nonprofit to others.